Aidan O'Brien has team for five for final Classic of year with unbeaten Lah Ti Dar and Derby runner-up De Ex Bee among opposition. Kew Gardens and Lah Ti Dar feature among a final field of 12 for the William Hill St Leger at Doncaster on Saturday. Aidan O’Brien is seeking a sixth success in the world’s oldest Classic, which was first run in 1776 and forms part of the Long Distance category of the QIPCO British Champions Series. He has said Kew Gardens, winner of the Queen’s Vase and a Group 1 contest in France this summer, is his principal candidate but he will also be represented by Nelson, Southern France, The Pentagon and Zabriskie. Lah Ti Dar, trained by John Gosden and owned by Lord Lloyd Webber, made it three wins from as many starts with a stunning ten-length win in the British EBF & Sir Henry Cecil Galtres Stakes at York last month, having spent midsummer confined to Clarehaven because of illness. Connections toyed with running her in the Prix Vermeille at ParisLongchamp on Sunday but instead have opted to take her to Town Moor. She will be partnered by Frankie Dettori who, like O’Brien, has five St Leger wins on his CV. “Frankie was adamant she should she should run in the St Leger when he got off her [at York] and often the feel a jockey gets when they immediately get off a horse if the one to listen to,” Gosden said. “He said he could have kept going another three furlongs and she certainly stays well. The daughter of Dubawi had been off 109 days before her runaway win at York but Gosden, aiming for a fifth St Leger triumph, said she lacked nothing in condition. “I had no doubt about her level of fitness but when they’ve been sick like that you worry,” he said. “It was a strange sort of viral thing. Nothing else in the place had it – her bloods were all wrong and she was very down in herself. “The great thing is that the one day she showed it to us she’d only done a gentle canter that morning – thank God she hadn’t worked. “She wasn’t right that afternoon – she had a temperature and we stopped. To that extent you are always terrified about doing some damage to a horse if you go and work them and then they are not right the next day, but luckily she had all the rest and all the time [she needed]. Attempting to upstage O’Brien and Gosden will be Middleham Park Racing, the syndicate which has about 650 members under its umbrella. Their colours will be carried by the progressive Richard Hannon-trained colt Raymond Tusk, who won the British Stallion Studs EBF Glasgow Stakes at Hamilton in July before finishing runner-up to the year older Hamada in the Irish Thoroughbred Marketing Geoffrey Freer Stakes at Newbury on his latest start. 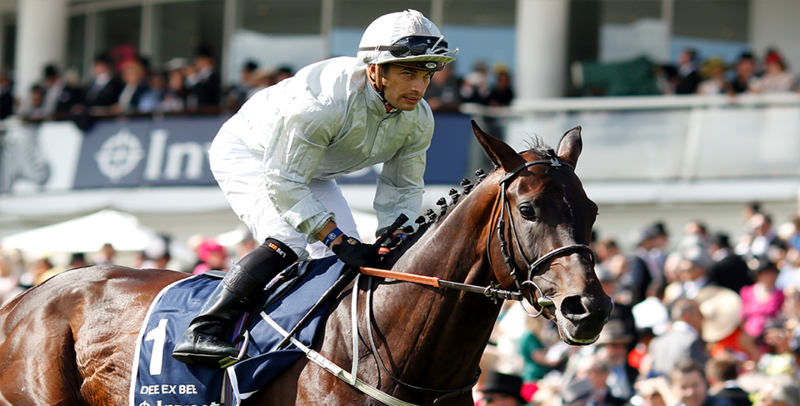 Andrea Atzeni, successful in the St Leger on Kingston Hill (2014) and Simple Verse (2015), takes the ride. Kulbir Sohi owns just over half of Raymond Tusk but there are nine other members in the syndicate. Sohi named him after a character in the American TV show House Of Cards. “Richard doesn’t call his geese swans and is adamant he has a very decent chance,” said Tim Palin, racing manager of Middleham Park. “He cannot see him running anything other than a massive race. “The further he goes the better he seems to get and that is borne out by his time figures and performance figures, whether it be the Racing Post or Timeform. They seem to see him as being on an upward curve over further. “He did not quite get the run or race or settle early on in the Geoffrey Freer. He got a little bit outspeeded and outclassed by the winner but it was still a good performance and demonstrated he might well appreciate a little bit further. Middleham Park have enjoyed more than 950 winners since being launched in 1995 but have yet to have a Classic success. The closest they came was in the St Leger two years ago when Ventura Storm, also trained by Hannon, was collared in the final strides by Harbour Law. Just seeing the syndicate’s pale blue and orange colours in the race will fill him with pride. “For our silks to be on the Champions Series billboards in the paddock beforehand is a great privilege,” he said. “We’ve more than done what we set out to achieve. I often describe it as a hobby with a few friends that got out of hand. Godolphin are undoubtedly part of that royalty and Sheikh Mohammed’s operation will be represented by two runners – Loxley and Old Persian – both trained by Charlie Appleby, who landed the Investec Derby in June with Masar. Old Persian, the mount of William Buick, stated his case with a determined win in the Sky Bet Great Voltigeur Stakes at York last month, when Kew Gardens, who was burdened with a 5lb penalty, kept on for third. Meanwhile, Loxley, who will be ridden by James Doyle, put up a career best when winning the Group 2 Lucien Barriere Grand Prix de Deauville on his latest start. Mark Johnston has had a season to savour, becoming the winning most trainer in British racing history, and a first St Leger victory with Dee Ex Bee, the Investec Derby runner-up, would undoubtedly cap it. Maid Up secured her fourth win of the season in the Group 3 Ladbrokes March Stakes at Goodwood last month and has been supplemented at a cost of £50,0000. The last filly to be be supplemented for the St Leger was Simple Verse, the dramatic 2015 winner. Proschema, trained by Tom Dascombe, completes the line-up.